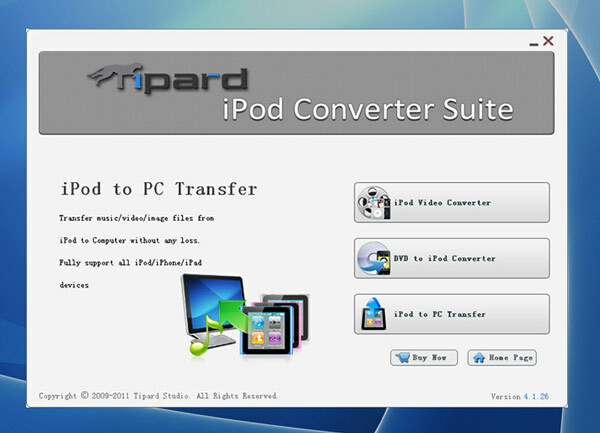 Tipard iPod Converter Suite contains iPod Video Converter, DVD to iPod Converter and iPod to PC Transfer. It can rip DVD and convert popular videos to iPod formats. And it supports iPod Touch 5, iPod nano 7, iPhone 5s/5c, iPad Air and iPad mini 2. Tipard iPod Converter Suite packs iPod Video Converter, DVD to iPod Converter and iPod to PC Transfer. It can help you rip DVD and convert popular videos to iPod formats. Besides, it can support English/French/German/Japanese four interface languages. And now it highly supports iPhone 5s/5c, iPod Touch 5, iPad mini 2, iPad Air, iPad mini 2, Microsoft Surface, Samsung Galaxy and iPod Nano 7. key function 1.Rip DVD movies to iPod supported formats Tipard iPod Converter Suite can help you rip DVD movies to iPod video format on multifarious iPod devices, like iPod, iPod nano 4, iPod nano 7, iPod touch, iPod touch 2, iPod touch 4, iPod touch 5, iPod classic, iPod shuffle, iPhone 5s/5c, iPhone 5, iPhone 4S, iPhone 4, iPad mini 2, iPad Air and iPad 4, etc. 2.Convert any popular video/audio Tipard iPod Converter Suite allows you to convert multiform video files and audio files to iPod. 3.Transfer various files from iPod to Computer This iPod Converter Suite can transfer music/video/image from iPod to computer and it can help you backup iPod video, audio files to PC, then you could transfer the video, music to another iPod or iPhone. 4.Powerful editing function You can crop the video frame to remove the unwanted playing areas and the black edges to fit your player's screen. Besides, it can watermark your video in the form of a text or image. What's more, you can set its position and transpacency and Trim any segment of a video and join several pieces together as a single one. 5.Adjust video effect You can adjust the video brightness, saturation and contrast. Besides, you can convert an interlaced video effect through the function of "Deinterlacing". 6.Freely select audio track and subtitle Tipard iPod Converter Suite can help users choose the subtitles and audio tracks of the DVD and video. DVD to PocketPC video converter is an powerful and easy DVD ripper application for converting DVDs to PocketPC movie and video with excellent output quality. Convert Media is a powerful yet easy-to-use application that can convert DRM audio and DRM video to unprotected format.It supports audio to audio, video to video, and video to audio conversion. CD To WAV Converter can rip CD to wav so you can burn a copy of your favorite CD for your car. It copies the audio directly from your CD, which enables you to make perfect copies of the originals. It's a fast, easy to use but powerful tool. Specially designed for Sony Ericsson users, 4Easysoft Mac Sony Ericsson AMR Converter aims at converting various video, audio, HD video to AMR, MP3 on Mac,such as MPEG, VOB, DAT, MP4, M4V, TS, RM, RMVB, WMV, HD TS, HD MTS, HD MPEG, HD MP4 etc. You can convert music and grab audio CDs to 6 major audio formats: AAC, MP3, MP4, WMA, OGG and WAV. Clean, rich audio quality results and very fast encoding. Allmost all important audio formats are accepted as input, including audio CD tracks. FeyExtractor is an easy-to-work-with audio software that helps you rip and convert fast and reliably audio files into high-quality MP3s which you can then easily transfer to the portable device of your choice. Tipard DVD to AMV Converter for Mac is the best DVD ripping software and best Mac DVD AMV Converter for you to rip DVD to AMV, MTV and MP3, MP2, WAV audio formats for you to enjoy on MP4 players, as well as S1 MP3 players with video playback. This site does not contain serial number, crack, keygen Tipard iPod Converter Suite serial number : serial number is the simplest type of crack. A serial number(cdkey,product key,etc) is register the program as you may already know. a crack or keygen may contain harmful software. If you cannot find the exact version you want, just give it a try. for more information read .nfo/.txt/.diz file include in zipped file.